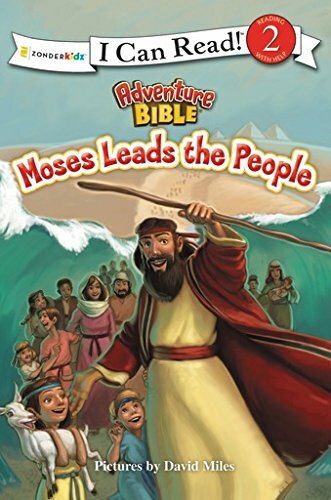 Moses Leads the People (henceforth, Leads the People) is an “I Can Read! Level 2” book adapted from the Adventure Bible put out by ZonderKidz. Fitting with the theme of the Adventure Bible, Leads the People recounts an Old Testament story while hinting at the future fulfillment found in Jesus Christ. This particular story focuses on the entirety of exodus story including the plagues and Egypt’s destruction in the Red Sea. During our first reading, Kenzie (almost 3 yrs) was rather taken aback by the directness of the book. Leads the People does not shy away from the full ramifications of the ten plagues brought by God upon the people of Egypt. Even the illustrations by David Miles do not hide the fact that God brought physical death as part of His plagues against Egypt. Kenzie listened with wide eyes throughout the first reading. This was particularly emphasized during the final plague and the crossing of the Red Sea. Parents with a mind for the spiritual truth(s) of the passage will need to describe how this story reflects upon Christian baptism and God’s “killing” of our sin. As a parent, I remain impressed that Moses Leads the People is one of Kenzie’s “naptime” reading book. She is enraptured, perhaps, with the story and God’s efforts to redeem His people. There remain some Biblical inaccuracies (e.g. Aaron traveling with Moses to Egypt) but the overall story remains true to the Biblical account. Much like God’s Great Creation, I am surprised and increasingly satisfied with the accuracy and focus of Moses Leads the People.